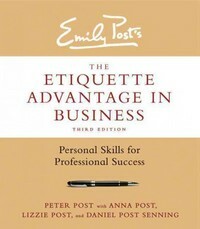 The Etiquette Advantage in Business 3 Edition Your key to professional and personal successCompletely revised and updated, the third edition of the Posts' The Etiquette Advantage in Business is the ultimate guide professionals need to build successful business relationships with confidenceToday, more than ever, good manners mean good business. The Etiquette Advantage in Business offers proven, essential advice, from resolving conflicts with ease and grace to building productive relationships with colleagues at all levels. It also offers up-to-date guidance on important professional skills, including ethics, harassment in the workplace, privacy, networking, email, social media dos and don'ts, and knowing how and when to take responsibility for mistakes.For the first time in business history, four distinct generations inhabit the workplace at the same time, leading to generational differences that can cause significant tensions and relationship problems. The Etiquette Advantage in Business aims to help navigate conflict by applying consideration, respect, and honesty to guide you safely through even the most difficult situations.Written for professionals from diverse backgrounds and fields, The Etiquette Advantage in Business remains the definitive resource for timeless advice on business entertaining and dining etiquette, written communications, appropriate attire for any business occasion, conventions and trade shows, job searches and interviews, gift-giving, overseas travel, and more.In today's hyper-competitive workplace, knowing how to get along can make the difference between getting ahead and getting left behind. The Etiquette Advantage in Business provides critical tools for building solid, productive relationships and will help you meet the challenges of the work world with confidence and poise.